Just when you think you heard all the possible idiotic puns on Noh, that is when a new onecomes up (usually from an American publication). I have already explored the topic in a previous post, but this time I give you.. 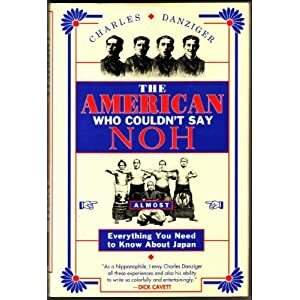 The American Who Couldn’t Say Noh, by Charles Danziger. I have already posted something on unconventional/ironic ways of using Noh theatre, but I think this goes beyond what I have encountered so far. I am unsure I understand the process that led to the creation of the video below; I don’t even know whether the Noh utai amateur pizza-ossan was a victim of this or if the pizza delivery-utai that you hear is actually his own creation. If so, well… hats off. Hey wait a second… now that I think of it.. I should be the one doing this!! I am collecting ways the word Noh has been used to create more or less funny or catchy puns on Noh (usually titles for newspaper articles). ‘Nō to ieru kyōgen’ (‘The Kyogen that can say Noh’), probably after the essay No to ieru nihon (‘Japan that can say No’) – suggested by Helen Parker. Do you have more to suggest?